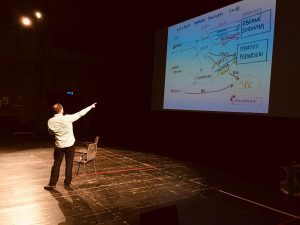 Blog by Chiara Badiali, Julie’s Bicycle, about the final CCL Conference in Krakow, Poland, December 2018. What does leadership mean in the time of climate change? There is a growing sense that our generation will be remembered most for how we respond to and help shape the trajectory of the global interlocking challenges taking on shape before us: climate change, environmental degradation, extreme inequality, migration and conflict exacerbated by environmental change, and the rise of nationalism as countries increasingly look inwards instead of outwards in response to these issues. Our success in meeting the Sustainable Development Goals is intrinsically linked to successful action on climate change. How do we, as artists and creatives, respond to the defining crisis of our time? Creative Climate Leadership was conceived as a programme to explore these questions, push them up the agenda of the arts and culture in Europe, and create a space to recognise and support the individuals in arts communities around the world already deeply involved in shaping the creative response to climate change. Our speakers and attendees reflected the breadth of how Creative Climate Leadership is expressing itself: from practical action to reduce the environmental impact of our activities, to capturing and working through hope and grief in our artwork, creating focal points for communities, and Together, we uncovered many shared challenges and experiences. Marilyn Averill, Senior Fellow with the Getches-Wilkinson Centre for Natural Resources, Energy and the Environment at the University of Colorado Law School (USA), gave us an overview of the current state of international climate negotiations, what needs to happen, what the COP process means for citizens, and how the creative community can make a difference. Polish artist-activist Cecylia Malik introduced us to her participatory protest art, born out of her piece 365 Drzew (365 Trees), for which she was photographed climbing a different tree every day for a year. Although the original motivation for this piece was not environmental, realising that not all the trees featured in the work were left standing pushed her to start learning about and engaging with environmental protection, which is now a theme that pervades her work. More recently, she conceived of Matki Polki na wyrębie or “Polish Mothers at the Felling”, in response to a change in Polish law giving permission to any landowner to cut down any tree on their property, which led to widespread clearing of trees across the country. The project features Polish mothers sitting on treestumps while breastfeeding their children, and sparked a viral movement of mothers recreating the scene. It culminated in Cecylia and a few of her friends travelling to Rome, to hand a report on the environmental destruction being wrought to the pope, and condemning the government’s actions as running counter to Christian notions of custodianship (the Catholic Church is a strong force in Poland). Michael Soro of Native Events (IE), who attended the Creative Climate Leadership course in Wales in March 2017, presented his varied portfolio of work to green the festival industry – from designing and building his own mobile solar power array, to organising inspirational environmental speakers at festivals, and establishing a space for the creative re-use and up-cycling of set and exhibition materials in Dublin. He spoke poignantly about how, as someone who had never thought of themselves as an artist previously, CCL opened the door for him to start recognising his own practice as part of a spectrum of creative climate work blurring the lines of ‘traditional’ practice. Michal Sládek, production manager of Pohoda Festival (SK) gave us a tour of how the 30,000 capacity festival threads sustainability through its operations, winning the GO Group Green Operations Award at the European Festival Awards in 2017. A specific focus was his recent efforts to overhaul the event’s waste management systems to introduce new waste streams like organic waste – and reducing the overall volume of waste by introducing reusable cups across the whole site. One of his insights was how we can overcomplicate sustainability by making assumptions about audience demands – driven by concern that audiences might not want to drink wine from re-usable plastic cups, the festival invested in a high-end reusable steel wine glass that audiences could get for a higher deposit: take up was extremely low, with the vast majority of attendees perfectly happy to use the standard plastic reusable cups. 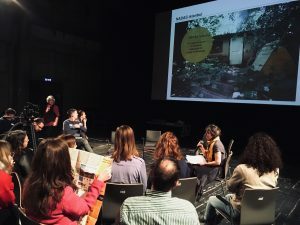 Gaja Mežnarić Osole, a designer who attended the CCL course in Slovenia in October 2017, presented the many strands of her work exploring the relationship between invasive species, sustainability, and society – including ‘Notweed’ paper, created from Japanese knotweed, and a project exploring how invasive species can help feed emerging circular economies in cities: in this case, using invasive knotweed collected in urban areas as a source of cellulose in paper production to displace the need for tree plantations. Gaja also explored the challenge of obtaining funding for work in this space, highlighting the importance of EU funding as well as her and her design partner’s decision to market and sell Notweed paper as a possible income stream to support other areas of their sustainable design work. Jessica Sim, who also participated in the CCL course in Wales in March 2017, is a curator, artist, and co-founder of NADAS in Istanbul. Her participation in CCL and subsequent CCL in Action project led to her meeting her current collaborator, with whom she set up NADAS. Their vision for the space is a creative oasis that is run according to sustainability principles, bringing communities together and providing space for projects and exhibitions that value and explore the relationship between people and their environments. 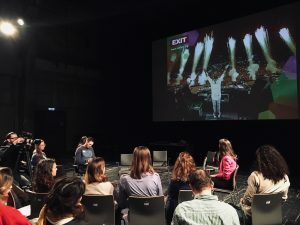 CCL partner EXIT Festival’s Milica Đilas explored the ways in which EXIT Festival is using its leverage as a youth culture brand to distribute environmental messaging among youth in the Balkans. The festival was founded in 2000 as a student movement, fighting for democracy and freedom in Serbia and the Balkans, and it sees its environmental activities as an extension of this work. And artists Lucy Neal and Shelley Castle, both creative associates with Encounters Arts (UK) gathered us round to talk about their evolving Walking Forest project, a project drawing inspiration from forests, the suffragette’s acts of disobedience, and the movement to enshrine the rights of nature in our legal system. It involves the gifting of seeds from an Austrian pine, the last tree standing in an arboretum originally planted by a group of suffragettes (one tree for each of them, to symbolise that they might not witness the future fruits of their work, but that the trees would bear witness) to current change-makers as a seed of hope and change in our current fight against climate change. The 100% vegan lunch provided by Krakow-based catering company Umami was a highlight of the day. The main CCL partners involved in the organisation of the CCL conference were EXIT Festival, Julie’s Bicycle, and Green Culture Montenegro / krug. Should artists step forward and become politicians in order to effect real change within our political systems? Or does the act of ‘becoming a politician’ undermine something about what we understand about art, and the kind of freedom of expression we might hope for from our artists and creative institutions? 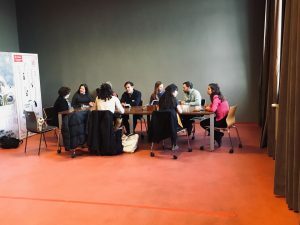 How can we foster a creative climate movement that recognises each other and supports others across the globe, especially those in contexts where the consequences for political and environmental activism can include incarceration or threats of physical violence? 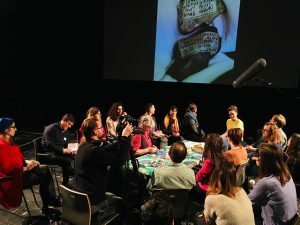 Can we recognise the ways in which we work as part of a holistic practice that isn’t just about the end result or piece of art – and therefore place environmental sustainability at the heart of the way we work as artists and creative? Like our understanding of climate change, our responses to these questions are and must be ever-evolving, adapting and shifting as the nature of the challenge (and the required response) shifts.